Card Text Play: Deal 2 to each other undamaged creature. Flavor text He’s much bigger in person. 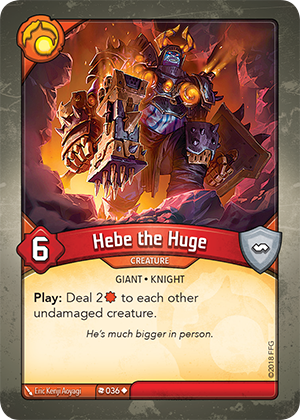 Does Hebe the Huge’s “Play:” ability affect only undamaged enemy creatures? No. This is affects every undamaged creature, including your own.